Perfect Black Friday Christmas Gift for You, or The Golfer on your list; Give Them the Ability to Develop a Classic Golf Swing! To assist those who are trying to buy the perfect Black Friday Christmas gifts for that golfer on their list, may I suggest one of the most detailed, instructional books on the market for that classic golf swing. 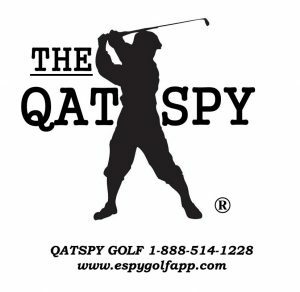 The ESPY Golf Swing Coach is a collection of tee-to-green golf lessons, including life lessons that my grandfather, Homer Q. Boatright, wrote down in his little red book. ALSO, Don’t forget to visit my TACK ROOM at the end of this article for more Christmas gifts for you or the golfer on your list. My grandfather’s red book is a handbook on developing the classic golf swing, based on three simple techniques he learned from baseball. His little red book was simply referred to as The Red Book. The Red Book was a collection of proven golf swing techniques and golf swing tips that he gathered and used over his 70-years of playing golf from some of the best avid and professional golfers of his time. 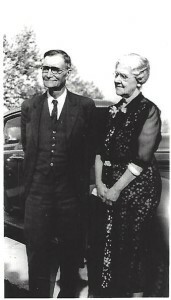 For the story behind my grandfather, please refer to: A PEDIGREE of a GOLFER, a GOLF COACH- and a GRANDFATHER! The photograph featured above was My Grandfather, Homer Q. Boatright, in 1946 at the North Hills Golf Course (Par 71) in North Little Rock, Arkansas. This golf course was designed in 1925 by Bobby Jones, Sr. This was the only golf course in Arkansas designed by Bobby Jones. How to SYNC and PRESET the wrists to maximize both power and clubhead speed at impact. How to preset the wrists in order to synchronize the elbows with the shoulders, a technique that Arnold Palmer worked with President Eisenhower on during an American Heart Association Pro-Am Charity Golf Tournament. How to develop the mental game of golf to utilize muscle memory for a more consistent golf swing. How to make a consistent chip and pitch shot, without doubt and/or nerves, refer to my YouTube Video below. How to develop a RIP 405- Training Drill, a scrimmage-type golf practice for a more reliable golf game. How to eliminate the Dr. Jekyll-and-Mr. Hyde syndrome in one’s golf game. You can’t buy a classic golf swing on Black Friday, but you can buy the manual and use my FREE YouTube videos series, Inside the Leather, to develop a classic golf swing from the ground up. This is one of the most detailed golf training manuals that the golfer can buy to improve their game, starting from the basics to advanced golf swing mechanics. It explains the WHAT, the WHY, and more importantly, the HOW! 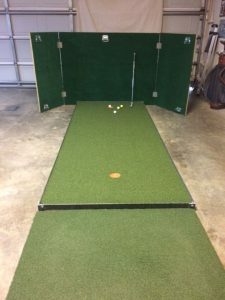 Wherever the golfer practices their putting, they can also perform a simple golf training grill, for a 4 foot to 8 foot Chip/Pitch Training Drill. 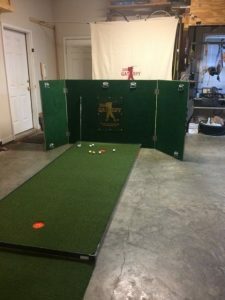 Just make sure you have a backstop, like I have here in my indoor chipping/pitching facility, featured below. The backstop catches those wayward chip/pitch shots that occur from time-to-time, especially if you are rusty. The same ESPY golf swing techniques used in the Chip/Pitch shots are the same basic golf swing techniques used to go from tee-to-green on the golf course. You will just need to develop a little more finesse, or feel, with the Chip/Pitch golf swing drill, as opposed to the regular part of your golf game. You can turn your Black Friday into red scores in a few weeks on your scorecard, for par or better. While I was working on the draft of my book, I was able, just by chance, to interview a golfer from Hattiesburg, Mississippi at his Country Club. He was a Vietnam POW held at the infamous Hanoi Hilton for over seven-and-a-half years. 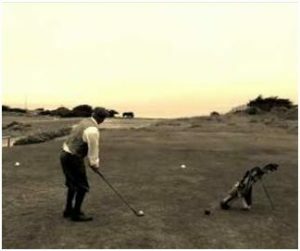 Colonel George Robert Hall survived his imprisonment under horrendous conditions by using his love for the game of golf. His story and my interview with Col. Hall are in my article A Memorial Day Hero From Hattiesburg, MS. This interview confirms not only the golf swing techniques, mechanics, and golf tips in my grandfather’s Red Book, but, more importantly, that golf is a mental game, played between the ears. 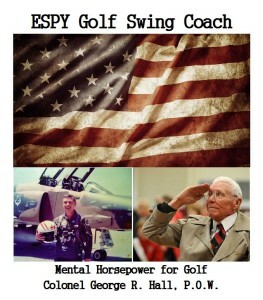 What Col. Hall experienced under these conditions confirmed the importance of the mental approach to the game of golf. Not many professional golfers could had achieved what Col. Hall did at the 1973 Greater New Orleans POW Pro-Am, only six weeks after his release. 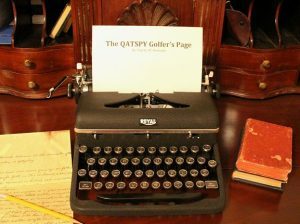 My interview with Col. Hall confirmed my grandfather’s coaching philosophy of Apperception, as this allows the golfer to take their baseball swing from the batter’s box to the tee box. The same preset wrist action used in the baseball swing is the same wrist technique, with some minor adjustments for the SYNC/PRESET golf swing technique. This similarities are striking from the time-lapse photo featured below. The golfer only has to perform two simple wrist elements to preset 80 percent of their golf swing sequence, called M-Dorsiflex (for the SYNC), and P-Pronation (for the Preset) elements. 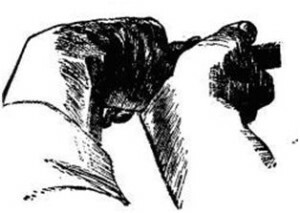 The golfer wants to place their wrists into the Preset Lock Position, shown below. As soon as the golfer gets into the Lock Position, the golf swing and baseball swing are virtually the same swing. If the golfer trains using the MP golf swing technique, they can see dramatic improvements in their golf game. The MP consists of two knuckles on the right and left hand to preset the SYNC/PRESET wrist action. MP is the Middle knuckle in the Dorsiflex and the Pinky knuckle in the Pronation. The golfer is essentially tracing the swing plane back to the Lock Position, shown in the illustration below. It doesn’t get any easier than this. For a limited time only (November 23 until December 15), if you purchase a paperback or hard copy book from my website, I will sign the book for your golfer, free of charge. Look for my December 28th article about New Year’s Resolution and improving your life and health. I hope and pray that in all respects you may prosper and be in good health, just as your soul prospers. 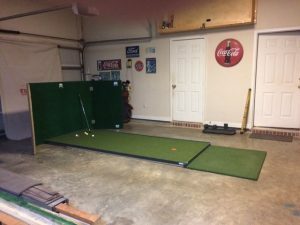 The DW Quail Golf Chipping and Pitching mat is an indispensable part of your golf game practice allowing the golfer to turn their garage into their indoor golf training facility. 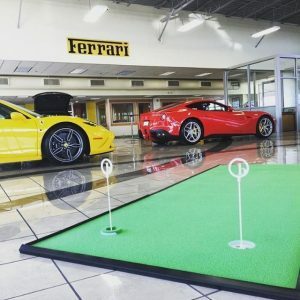 DW Quail Golf has a variety of Chipping/Pitching mats that are professional grade for indoor/outdoor use. These make excellent gifts for your golfer. This is a link to DW Quail Golf website.